The Canadian Medical Association Journal (CMAJ) recently published an article and two letters (see footnotes at the end of this post) that dispute (one of the letters defends the marketing) the accuracy of the ads depiction of living with CF, and thus, question the effectiveness and appropriateness of the advertising campaigns themselves. The criticism is mainly directed at protecting CF patients and their families. The main target of the criticism is an ad that depicts CF as being “like drowning on the inside” and the ad shows a child’s face barely held above the water, visibly struggling not to drown. This is most distressing for CF patients and their families, as it puts a very real visual of “what’s to come” to a disease that many live in denial about. The ad comes in two forms: there is a print version, and there is also a 30 second video version. 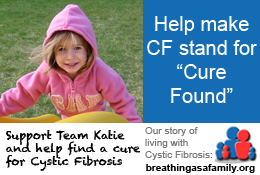 Many families that live with CF live in denial that CF will catch up with them. This is a survival tactic that allows patients to live a life of hope, living with the understanding that they may beat the disease. When vivid visuals are shown, it does provide a real-life horrific reminder of what CF patients live with and what they may experience as CF wears away at the lungs. As a parent of a child with CF, I was horrified the first time I saw this ad. Others close to our family are unable to watch the ad. Most days, we do well to put it out of our minds, hoping that a cure will arrive before disease progresses to a point of no return. The ethics of these advertising campaigns are unclear. The concern to protect CF patients from such graphic and scientifically debatable depictions of the disease is understandable. Yet, it is difficult to truly understand what CF feels like. Thus, “shock and awe” advertising does raise awareness, and with it, funds that are desperately needed for additional research to help find a cure. I don’t know about you, but, I’m willing to tolerate a bit of debate over the accuracy of the ads if it means additional awareness. I say kudos to the Canadian Cystic Fibrosis Foundation for their campaign. While disturbing to those of us that live with CF each and every day, I am thankful for the awareness and the benefits that the advertising generates. Raising money for cystic fibrosis: At what price? This is the old double edged sword in the world of a non-profit – especially one fighting for dollars against the “big” diseases. Here’s my issue with the ad; I think it sets up uneducated parents to protect or even hold back their child with CF to the point that it’s dangerous. Most CF children aren’t “drowning on the inside”, in fact, many children with CF have similar lung function as the kid next to them. This treatment by parents is dangerous in the fact that we as CFers, often reflect the same attitude towards CF as our parents did. I can tell you that being seen as “weaker” and needing to be protected can be worse for our health than the actual CF is. We need parents that offer no excuses and have a “grab the bull by the horns” mentality. With that said, the ads speak to the power as showing children as victims. Tugging on that heart string often leads to donations, donations lead to better medicines, better medicines lead to a better life. I think it’s a shame that in order to solicit funds, we must often tell a sad story and “stretch the truth”. Even at the expense of the mental state in the CF community.